David Crawford’s super-strong Grant Sheds farm shed showing the lean-to side which houses smaller farm and family vehicles. Ever since popular Strathalbyn farmer, David Crawford has been on his property, ‘Middlegrove’, he has put up with a small, 70 year old shed – and, as most farmers would understand, David suffered major ‘shed envy’. Every farmer understands the longing to own a decent sized shed to work in comfortably and to store all his machinery, vehicles and implements, to ensure they are protected from the weather – and David has dreamt of little else for 30 years. The original shed was an old dairy with a dirt floor and low roof and it was far too small and far too low to be of any use at all to today’s modern farmer. “Anytime I needed to service some equipment, I had to park it outside of the shed and work out in the weather – rain or shine – then pack it away again each day to protect it from the weather and from being stolen,” explains David. But his quest to find a new shed was not as straight forward as he had hoped. “I looked at a number of sheds on other people’s farms and talked to them about their sheds and was amazed to find they had issues like poor quality materials and the general construction was a bit second rate in the sheds they bought. Even in some relatively new sheds the owners could point out signs of rust and fatigue. I was shocked at the poor quality of what our local farmers have to put up with,” says David. An example of the added value you get with a ‘Grant’ shed. 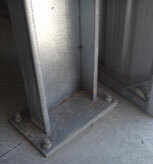 Good, strong welded base plates and 4 x 24mm footings bolts, where as many others use only 2 much smaller footings bolts and often just a simple non-welded angle bracket to bolt columns to concrete. David is extremely pleased with his recently constructed Grant shed. David’s dream is now a reality. When each pair of doors is open it gives David 30’ wide openings so he can fit his modern large farm equipment like boom spray and harvester in easily. At his ‘Shed Opening Party’ which was attended by 50 locals as well as the team from Grant Sheds, David paid tribute to his wife Andrea and to Grant Sheds by thanking them for their effort and for their free advice in their special farmer help guide titled “The Farmers Guide To Choosing The Best Farm Shed” which explains the 7 big costly mistakes shed buyers make – and how to avoid them, as well as listing the important questions you should ask before you buy your next shed. David advised all farmers interested in learning more about buying a farm shed that is really suited to their needs to get a copy of the Grant Sheds report as it saved him thousands of dollars and lots of headaches. You can request a FREE copy of the report by calling 1300 064 775 24 hours, 7 days a week, and using the code word BLOG. It reveals the big difference between a farm shed that’s made “on the cheap” and one that’s really suited to your needs. It’s called, “The Farmers Guide To Choosing The Best Farm Shed For Your Rural Property”, and tells you “The 7 Big Costly Mistakes Shed Buyers make – And How To Avoid Them”. Simply call the 24 hour, 7 days a week pre-recorded message line on: 1300 064 775 and leave your name, email and postal address and the code word “Blog” and we’ll send a copy to you ‘pronto’. Or go to https://www.grantsheds.com.au/information-pack and complete your details on the form. David said that he looks forward to doing mechanical maintenance on his farm equipment in the new shed. In the past he had to brave the elements of heat, cold, wind and rain outside and that was never much fun. He is also looking forward to undertaking a few production jobs at his new workbenches. And his wife….? Well David allowed her an area in the new shed for her car and for storing some household items which were cluttering up the house. And we know Andrea must be happy because she spent hours sorting through all David’s collections of nuts and bolts, spare parts and bits and pieces to help him get his spare parts section well organised right from the start. And he’s tickled pink with that! Here’s what David Crawford says about his new ‘Aussie Tough’ farm shed from Grant Sheds. BIGGER & STRONGER – AND A 50 YEAR GUARANTEE! “Before I bought my shed I looked at sheds on other farms and was amazed to find they had poor quality materials and second rate construction …even signs of rust and fatigue. So when I walked into a shed built by GRANT SHEDS, the quality just stood out compared to other brands I’d seen. Things were bigger and stronger – and they have a 50 Year Guarantee! That’s why I bought a Grant Shed. You can check out more comments from others about their Grant Sheds here https://www.grantsheds.com.au/what-others-say/ . You can even select your own area to see what people from your community are saying.